PROVIDENCE, R.I. — Beginning Friday, May 12, 2017, the public will see two hot pink Rhode Island Public Transit Authority (RIPTA) buses and two equally pink RIde paratransit vans making their rounds throughout the state. The specially wrapped buses will carry the message, “Getting checked now, saves lives down the road,” and are part of a yearlong campaign intended to raise public awareness about women’s breast health and the importance of routine screenings. The campaign is brought to the public through the partnership of RIPTA, the Gloria Gemma Breast Cancer Resource Foundation and Southcoast Health, a regional healthcare consortium. 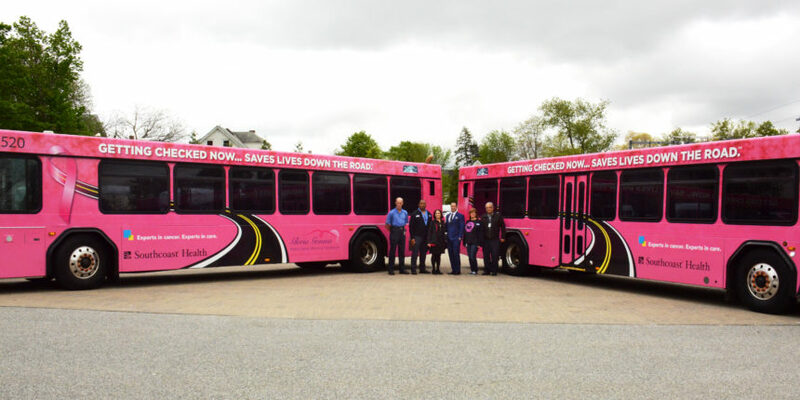 The campaign replaces RIPTA’s traditional one-day “Pink Out” in the hope of creating even greater public awareness by having these very visible vehicles on the road for at least a year. “People will not be able to miss these wrapped buses and RIde vans, and that’s the point,” said Barbara Polichetti, Director of Public Affairs for RIPTA. “Their message is clear regarding the importance of mammograms and other screenings for breast health. We hope that by having these vehicles on the road, we will reach even more people than we have with our traditional ‘Pink Out’ day in the past.” Previously, drivers had donned pink t-shirts for the daylong event. Polichetti said that RIPTA’s bus operators will still be participating, with drivers in the RIde program wearing pink on Friday, May 12, in honor of Mother’s Day. Also, RIPTA will soon be incorporating an embroidered pink ribbon – the iconic symbol of breast cancer awareness – on the uniform hats for all its drivers. “RIPTA is grateful to have strong community partners committed to helping educate women, and their families, about breast cancer,” Polichetti said. One in six Rhode Island women will be diagnosed with breast cancer during her lifetime. The Gloria Gemma Breast Cancer Resource Foundation, a Pawtucket-based nonprofit established in 2004, offers free breast health education, awareness, and support programs statewide, in addition to some parts of Massachusetts and Connecticut. Southcoast Health is a community-based health delivery system with multiple access points, offering an integrated continuum of health services throughout Southeastern Massachusetts and parts of Rhode Island. Visit Gloria Gemma Breast Cancer Resource Foundation at www.gloriagemma.org for a comprehensive list of all their breast cancer resources. For more information on Southcoast Health, visit https://www.southcoast.org. For information on RIPTA’s services, call 781-9400 or visit ripta.com.